Definition at line 62 of file llvisualparam.h. Definition at line 42 of file llvisualparam.cpp. Definition at line 67 of file llvisualparam.h. Reimplemented in LLDriverParamInfo, LLPolySkeletalDistortionInfo, LLPolyMorphTargetInfo, LLTexLayerParamAlphaInfo, LLTexParamColorInfo, and LLViewerVisualParamInfo. 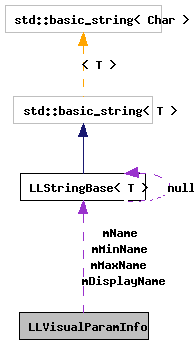 Definition at line 56 of file llvisualparam.cpp. References LLXmlTree::addAttributeString(), FALSE, LLXmlTreeNode::getFastAttributeF32(), LLXmlTreeNode::getFastAttributeS32(), LLXmlTreeNode::getFastAttributeString(), LLXmlTreeNode::getFastAttributeU32(), llclamp(), llendl, llwarns, mDefaultWeight, mDisplayName, mGroup, mID, mMaxName, mMaxWeight, mMinName, mMinWeight, mName, mSex, NUM_VISUAL_PARAM_GROUPS, SEX_BOTH, SEX_FEMALE, SEX_MALE, LLStringBase< char >::toLower(), and TRUE. Definition at line 64 of file llvisualparam.h. Definition at line 81 of file llvisualparam.h. Referenced by LLVisualParam::getDefaultWeight(), and parseXml(). Definition at line 75 of file llvisualparam.h. Referenced by LLVisualParam::getDisplayName(), parseXml(), and LLVisualParam::setDisplayName(). Definition at line 78 of file llvisualparam.h. Referenced by LLVisualParam::getGroup(), and parseXml(). Definition at line 72 of file llvisualparam.h. Referenced by parseXml(), LLTexParamColor::setInfo(), LLTexLayerParamAlpha::setInfo(), LLPolyMorphTarget::setInfo(), LLPolySkeletalDistortion::setInfo(), and LLDriverParam::setInfo(). Definition at line 77 of file llvisualparam.h. Referenced by LLVisualParam::getMaxDisplayName(), parseXml(), and LLVisualParam::setMaxDisplayName(). Definition at line 80 of file llvisualparam.h. Referenced by LLVisualParam::getMaxWeight(), parseXml(), LLDriverParamInfo::parseXml(), LLVisualParam::setAnimationTarget(), and LLVisualParam::setWeight(). Definition at line 76 of file llvisualparam.h. Referenced by LLVisualParam::getMinDisplayName(), parseXml(), and LLVisualParam::setMinDisplayName(). Definition at line 79 of file llvisualparam.h. Referenced by LLVisualParam::getMinWeight(), parseXml(), LLDriverParamInfo::parseXml(), LLVisualParam::setAnimationTarget(), and LLVisualParam::setWeight(). Definition at line 74 of file llvisualparam.h. Referenced by LLVisualParam::getName(), and parseXml(). Definition at line 82 of file llvisualparam.h. Referenced by LLVisualParam::getSex(), and parseXml().